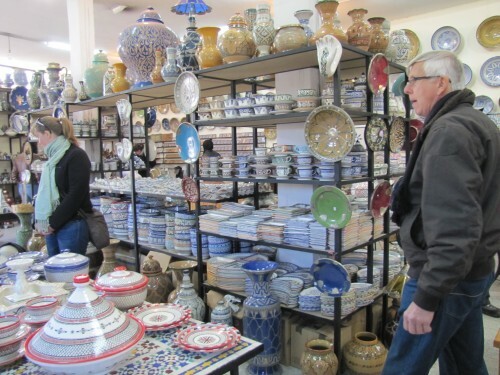 One of the delights of our visit to the city of Fes in Morocco was to visit the ceramic pottery factory and shop outlet, as shown in today’s photos (and in the previous few days of my posts here on this site). 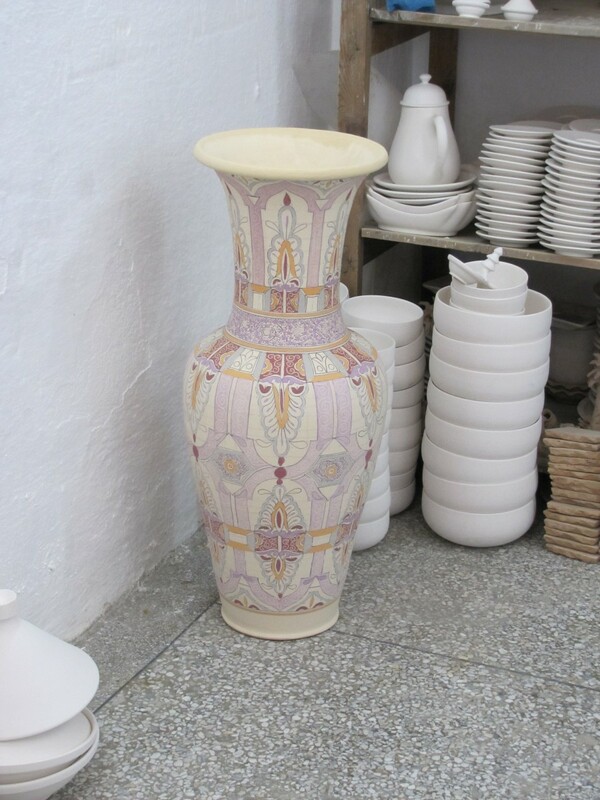 On the other hand, one of the disappointments was being unable to buy any of the wonderful items for sale. 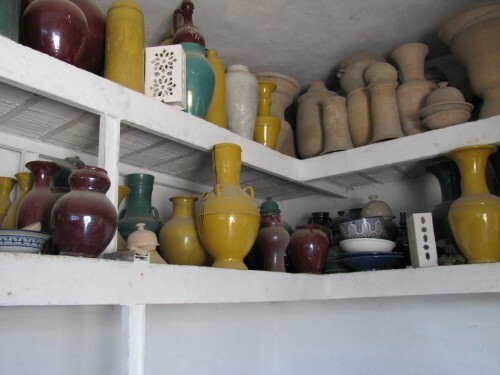 Many of them were far too delicate to travel in our normal luggage and others were either too big or too heavy. The shop did offer to ship any item to Australia – even the large patio fountains weighing many hundreds of kilograms – but the cost would have been prohibitive on my limited budget. 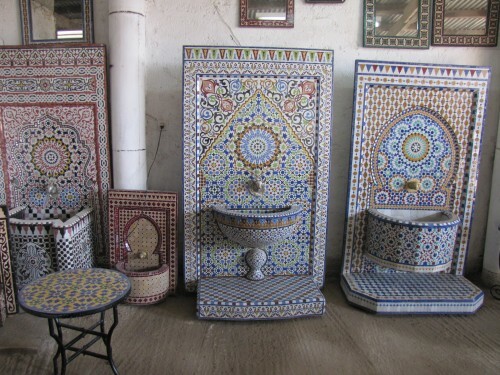 The mosaic work shown in the photo above is from one of the fountains for sale in the ceramic pottery factory in Fes, Morocco. Fountains like this one are in evidence throughout the land, both in public and private buildings. 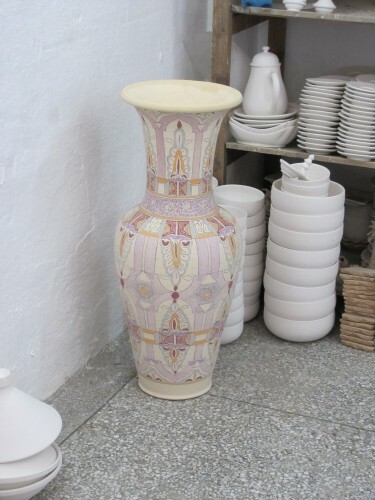 During our visit to the factory and the adjoining shop we saw many beautiful items being made or for sale. Finished products at the ceramic pottery factory in Fes. The beautiful fountains shown above were on display and sale at the ceramic pottery factory we visited while touring Morocco. 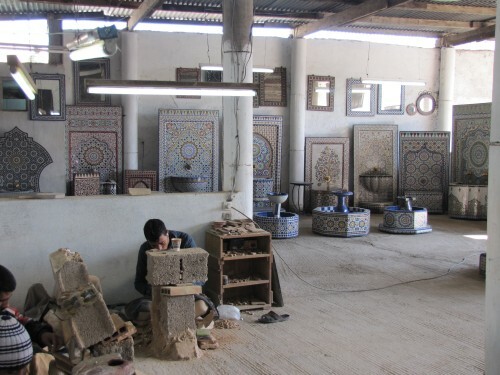 This particular factory was in the heart of the large city of Fes. 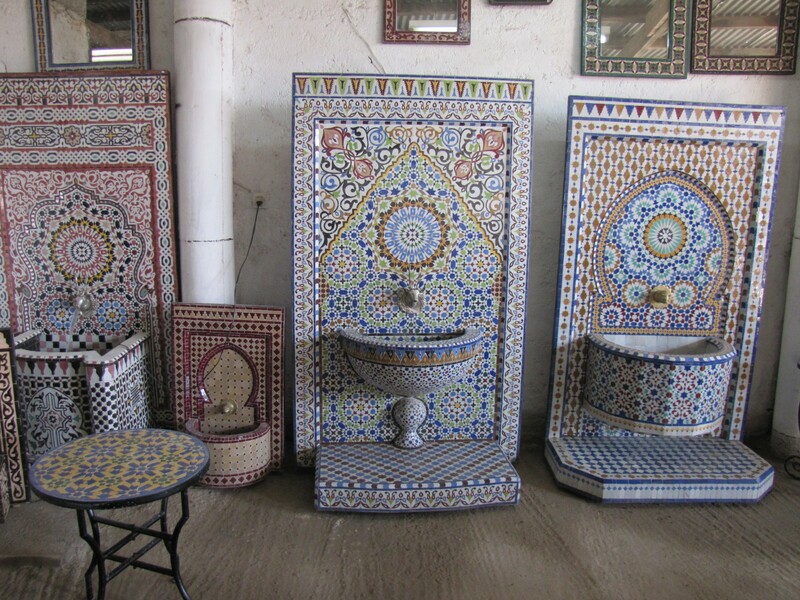 Fountains like these certainly are seen to adorn many Moroccan houses and buildings and would be a delightful addition to an upmarket home here in Australia, if only for the item being an amazing talking point – or status symbol. While my wife and I would have loved one, it would sadly be very much out of place in our home. And the bank balance would have been severely dented to buy it – and then get it all the way here to Australia. 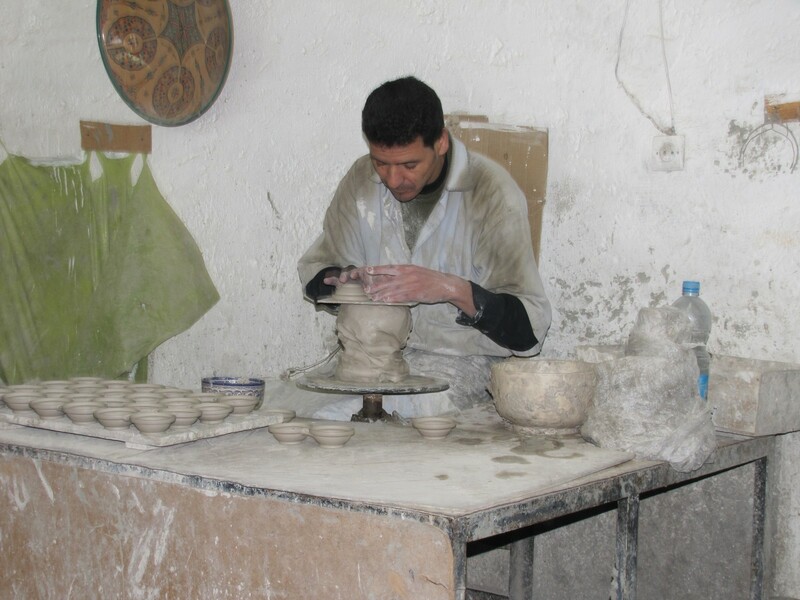 Ceramic pottery factory in Fes. 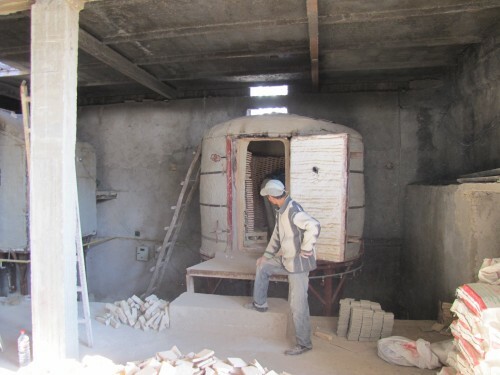 Kiln in the ceramic pottery factory in Fes. 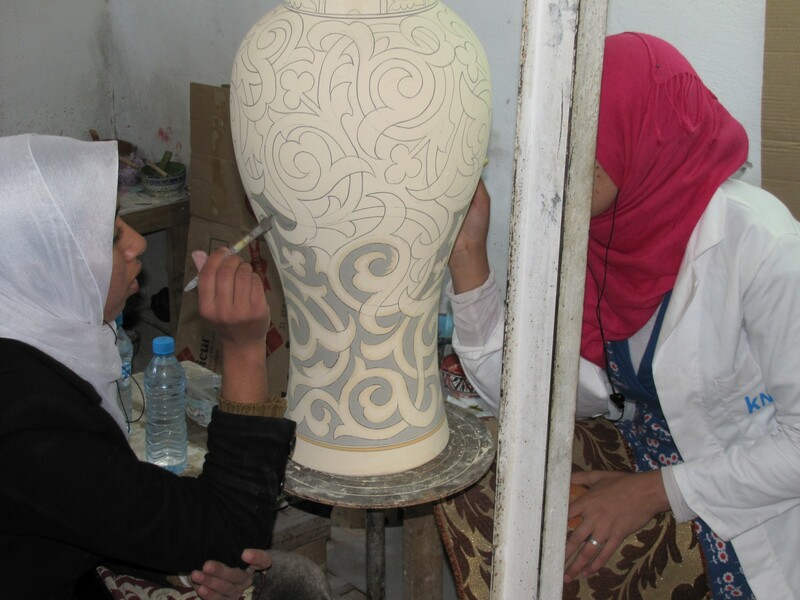 During our visit to the city of Fes in Morocco we visited a large cooperative ceramic pottery factory, as shown in today’s photos (and in my previous posting here – with more to come in a few days’ time). Our tour group spent over an hour in the factory and shop. 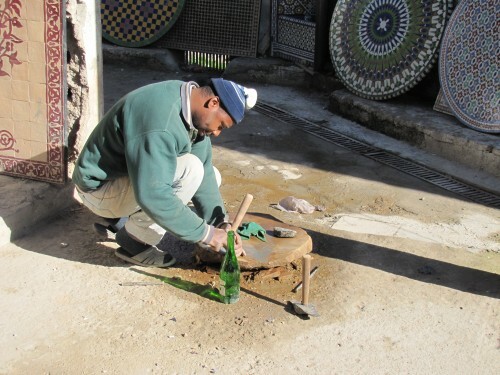 We were first taken on a tour of the artisans at work, observing first hand the delicate and intricate work being produced. We then had an opportunity to visit the adjoining shop and to purchase any of the finished items. 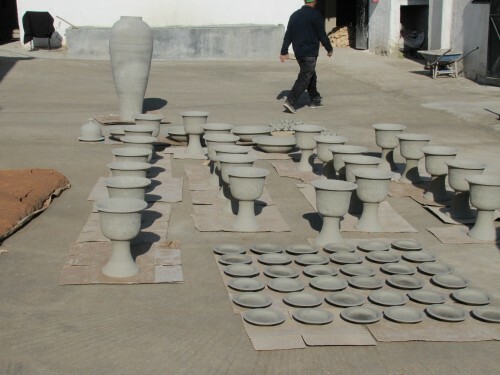 Some of the larger items would have been very difficult to export to Australia, but we were assured that they could be packaged suitably for the long journey. I guess that the freight would have been a little steep, so I didn’t enquire. 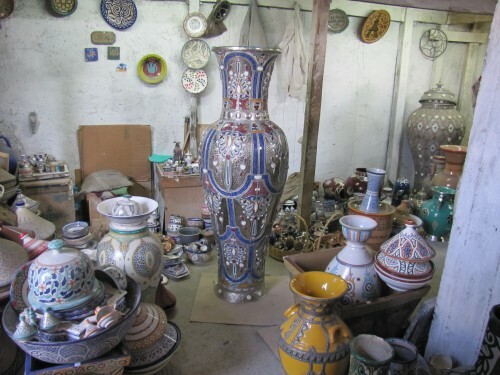 Many of the larger items were out of reach when I looked at the price, but it was a pity that even some of the smaller items would have added considerably to the weight of our luggage, not to mention that we were not even half way through out trip and keeping such delicate – and breakable – items safe might have proved a major headache. One of the places we visited while in Fes, Morocco, was a ceramic pottery factory and shop. We were able to see up close the intricate work of these talented Moroccan artisans. I found it fascinating to see their skills on display, from the raw clay through to the finished art work on display in the shop. 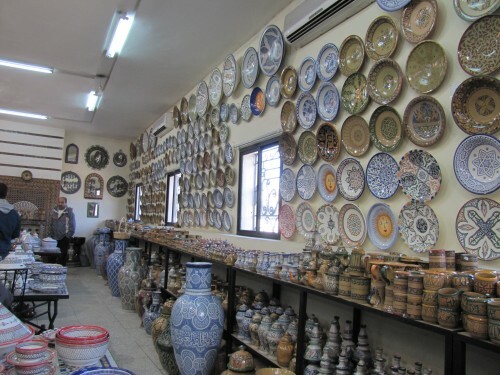 My only regret was that we couldn’t bring home with us some examples of their fine work (though my wife did manage to winkle one small item into her luggage). Over coming days I’ll show more of their fine work here on this site. 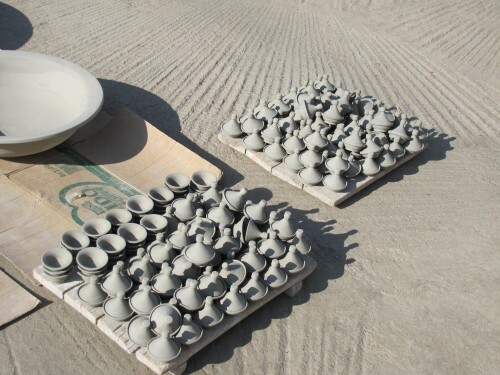 You have searched the blog archives for 'ceramic'. If you are unable to find anything in these search results, you can try one of the category links below.